CEEGE 2019, The 2nd International Conference on Electrical Engineering and Green Energy, will take place in Roma, Italy from June 28-30, 2019. The clean technologies are now making progress and hence the conference will focus on providing an opportunity to technologists, scientists, industrialists, environmentalists and experts to showcase their novel energy efficient technologies. The goal of the conference is to address energy and environment related challenges, especially those facing the developing world by providing networking opportunities for global collaborations for developing suitable solutions for diverse applications and user groups. The scientific program will include overviews, state of the art lectures and controversial debates, interactive education sessions,featured symposia, breakout sessions and oral presentation sessions for abstracts. Outstanding world leaders as faculty will present their research on modern technologies, providing solutions for sustainable development. Our endeavor is to provide a stimulating and thought provoking scientific program. This format includes a substantial allocation of time for interactive debates and questions from the audience to each panel of experts. Participants are encouraged to take an active role in the discussions with faculty members which follow each debate, in a unique and open environment. We sincerely hope that the blend of pleasant weather, warm hospitality and revitalizing social evenings will make the scientific environment richer. 2019-01-17 news!! Welcome Prof. Eduard Siemens, Anhalt University of Applied Sciences, Germany join and make keynote speech. 2019-01-05 news!! 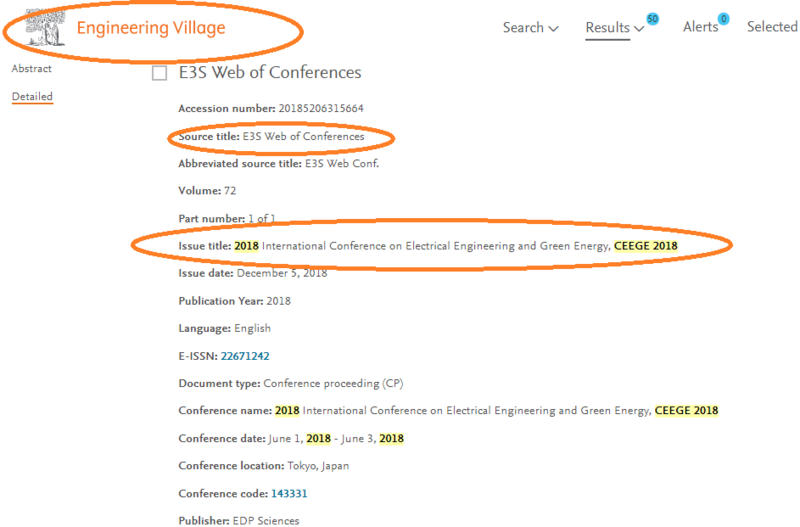 The conference proceedings of CEEGE 2018 has been indexed by EI Compendex successfully (Click) SCOPUS coming soon.